Chloromyia are small flat flies with metallic reflections. 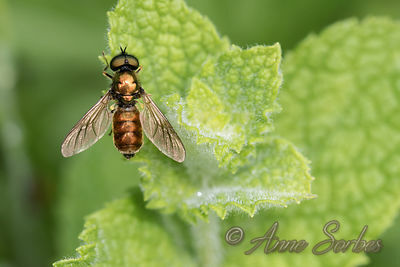 Adults are pollinators antd the larvae feed on decaying plant debris. Clitellaria ephippium male apparently tasting fallen pollen from neighboring trees on a fern-eagle leaf on the edge of a damp forest. 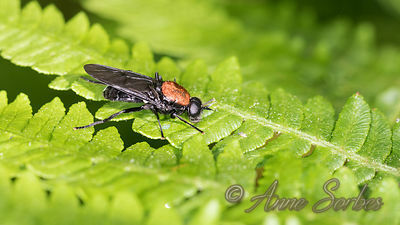 This fly of the family Soldier flies (Stratiomyidae) is quite rare and its behaviors poorly known. The larvae grow for 4 years and live in black ant (Lasius fuliginosus) nest, but I have not been able to determine whether they are plant and animal waste cleaners (like the larvae of other members of This family) or if they are predators and I have not found any information on the diet of adults.